This Butter Pecan Cupcake is tender, ultra-moist, loaded with pecans, and topped with salted caramel sauce and a maraschino cherry. The cupcake is amazingly delicious! Whisk flour, lightly spoon and level to measure, then sift twice into medium bowl with baking powder and soda. In bowl of a stand mixer or large bowl with a hand mixer, combine sugar, salt and 1 stick butter. Begin to add the eggs, one at a time, add vanilla with very last egg and beat till. On the low-speed of the mixer, add flour mix and then alternate with milk, beginning and ending with flour and add the nuts with last bit of flour. Fill muffin cups with about 1/4 cup batter. Cool on wire rack for 1 hour before frosting. 6 Tbsp. unsalted butter at room temp. Now scrape bottom and sides of bowl, begin to gradually add more powdered sugar and beat till soft peaks form. Add caramel sauce and continue to beat on low-speed until well incorporated. Increase speed to medium then to high about 2-3 minutes. 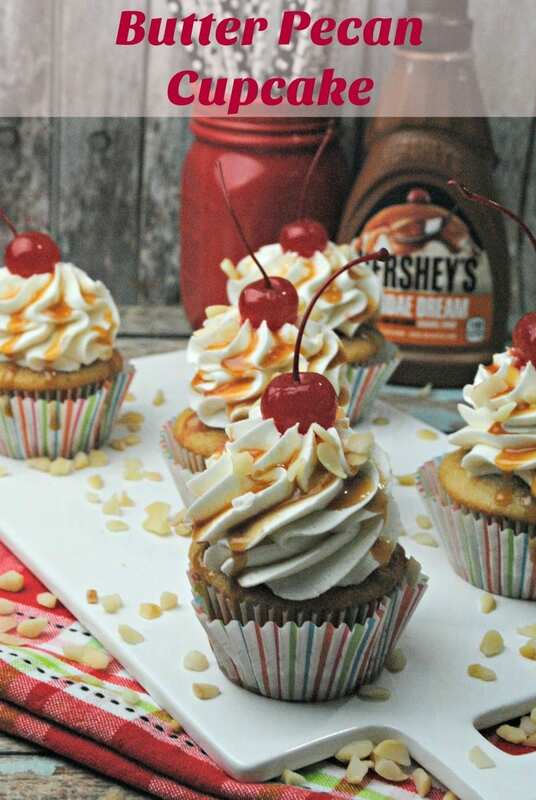 Top cupcake in the frosting, caramel sauce, and a maraschino cherry. I hope you enjoyed my Butter Pecan Cupcake recipe! If you make it, make sure to share with us on Facebook or Twitter! Also, check out all of our other Recipes. These look so good and tasty, plus they sound scrumptious, I could easily make these but they wouldn’t look that pretty or good!! Oh my these look so yummy!! I just love anything butter pecan!! I so must try!! These sound dreamy and have just the right amount of icing in my opinion! OH my those look and sound amazing. Butter Pecan was always one of my favourite ice cream flavours so this is a great idea for a cupcake. They look great. I have to try these! Thank you! This sounds so delicious. Pecans are good for you, so this is definitely breakfast worthy. My sister-in-law would just love these, she’s a huge pecan fan. When I go over to visit I always treat her to a special pastry with pecans. Oh I will be making these! Absolutely sounding delicious! These butter-pecan cupcakes sound delicious and look delicious.. Thank you for the wonderful recipe. The butter-pecan recipe for cupcakes sound delicious carmel drizzle mmmm!!! Ohhh these would be fantastic for Thanksgiving!